Venturing into a new genre is always a challenge, and audiences often have a hard time accepting that a performer or filmmaker is equally capable of making one kind of film as the one for which they are most known. To some, Jon Stewart is still the guy from “Big Daddy,” while most at least acknowledge the more intellectual comedian host of “The Daily Show” on Comedy Central. Making a dramatic film about the arrest and torture of a Canadian-Iranian journalist in Iran in the aftermath of the controversial 2009 elections is a big leap from political satire, but it’s clear that this is the kind of topic that matters most to Stewart. 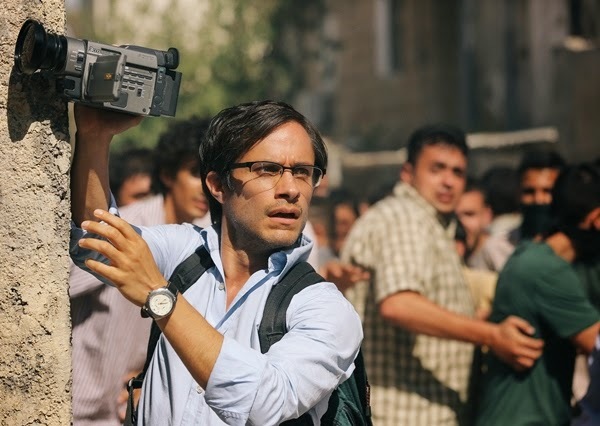 ”Rosewater” tells the real-life story of Maziar Bahari (Gael Garcia Bernal), who traveled from London to Iran in 2009 to cover the elections. What he found was enormous national support for Mir-Hossein Mousavi, the primary opposition candidate to sitting president Mahmoud Ahmadinejad. When the election results come in, however, it’s Ahmadinejad who is victorious, and by a suspiciously large majority. Staying with his mother (Shohreh Aghdashloo), Maziar awakens to find government authorities have come to question him, and he soon lands in a cell, blindfolded, interrogated, and told that he is a spy. At first, he responds with laughter at the notion and soon realizes that circumstances are much more serious than he could imagine. “Rosewater” has a meta moment in which Jason Jones, a regular player on “The Daily Show,” portrays himself, reenacting a segment with the real Bahari just prior to the election in which Jones pretends to be a “spy correspondent” speaking with Bahari, who jokingly confirms his identity as a spy. Stewart uses an altogether different tactic to expose the ridiculous of world events here, demonstrating how Bahari’s interrogation includes such outlandish and clearly made-up claims yet that’s what actually goes on in the world. The film isn’t immune to humor, of course, highlighted by Bahari’s attempts to have fun with his interrogator, making up lengthy stories about famed sexual massages in New Jersey to pique his interest. Bernal is the perfect actor to play Bahari, who at a press conference for the film demonstrated the same kind of fusion of likeable and knowledgeable personality that makes his attitude towards his circumstances considerably sunnier and more optimistic than another journalist’s might be. Stewart has told an important story in this film, and while it’s not that drama doesn’t suit him, he’s not yet the most finessed filmmaker, using a few tropes such as hallucinated relatives and fast editing that don’t lend themselves to the most well-rounded film. Bernal and this film’s message, however, remain powerful, as wrapped up in this decent if unextraordinary film.